Hi every one and thanks for stopping by. My name is Guylene hence comes Guysbiz Gift World. I love dealing with people and selling good quality and authentic items that I like and think other people would like to buy. I hope to make many new friends on Bonanza. It is a wonderful site with great sellers. 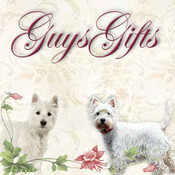 We have 4 westhighland white terriers that are the love of our lives, Samantha, Georgia, Jessica and Casper. (update we lost our beloved Samantha but now we add our sweet new baby Katie Lou) New update we since have lost our old lady Georgia Mae who was a nice 15 years old and such a loss to our family and just a week ago we lost Casper to a large cancer tumor on his back who was a large blow to us as he was such a sweet loving boy. Rest in peace all our babies!! We are now down to two westies and am planning on adopting one. Will keep everyone updated. We live in the beautiful state of Wyoming and enjoy our small town and all the people that live here. Please visit me often and would love to hear from anyone with questions or just want to visit. I ship world wide accepting pay pal, Amazon and google for purchase and shipping cost. I ship same day as payment clears if before 4:00Pm MST. If an item doesn't work our I usually accept returns within 7 days. Just let me know if there is an issue as soon as you receive your item, and I will do my best to resolve the problem quickly and to your satisfaction. For International buyers, if I have not put a price for shipping in, Please e-mail me for the cost of the shipping for the item you want to buy. GuysGifts doesn't have any items in their booth! Guylene is always so nice to everyone, she was one of the first people to welcome me to Bonanza. Also very helpful and generous with tags and tweets for your products. Check out her booth and don’t hesitate to buy! And don’t forget to take a look at those beautiful Westie photos too. Guylene is a very nice and caring person. She took the time to chat about our mutual love of Westies. Check out her booth for wonderful items! Guylene is such a sweet woman…I’ve been promoting her items for a few months now and she is so easy to talk to and always puts a smile on my face with her little messages she leaves me….she is a true asset to the Bonanza community….she offers HUGE savings on her items with alot of them shipping free!! Go check out her booth you will be glad that you did!! Thanks Guylene for not only letting me promote for you but also for becoming my friend!!!! Guylene is very friendly person, and I am glad to have met her here on Bonanza. She also has great items in her booth! Guylene is a wonderful and friendly member to deal with ! I wouldn’t hesitate to purchase from her !